Our fly fishing trips take care of all the details from guide to gear, allowing you to relax. Anglers of every experience level will want to take advantage of our guided fly fishing trips. First timers will benefit from in-depth instruction from casting to choosing the right fly. Veteran fisherman will love learning the best spots on Colorado’s rivers while taking advantage of the included fishing gear. Take advantage of the knowledge and skill of our experienced Colorado fly fishing guides. You’ll enjoy the serenity and beauty of some of Colorado’s top rivers and increase your chances of catching a fish, even if it’s your first time fly fishing. Experienced fishermen will appreciate additional tips and tricks as well as access to some of the best fishing spots. 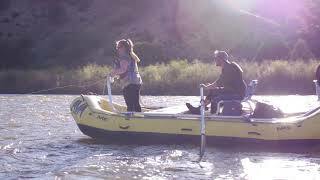 Float the picturesque Upper Colorado River to the best fishing spots while your experienced guide helps you with basic technique, proper casting, and fly selection to give you the best shot at landing a big one. Perfect for both novices and experienced fisherman, our Colorado River fishing trips allow you to float from fishing hole to fishing hole while your guide takes care of all the details from providing you with the necessary equipment to navigating the river. Our Kremmling outpost is now an Orvis Endorsed Fly Fishing Outfitter, so any and all angling gear you need is now available at this location. 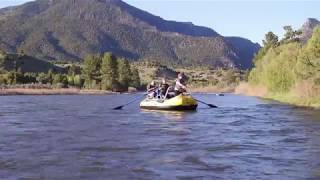 Walk and wade the Arkansas River with a guide who will teach you all the basics. Perfect for first timers, our Arkansas River fly fishing trips include all necessary gear and allow you to try out the sport at your own pace. Your veteran fly fishing guide will help you explore the river banks and various creeks in the surrounding area until you find the perfect spot where the fish are biting. Experienced anglers often choose to explore Colorado’s rivers on their own, but there are advantages to signing up for a guided fly fishing trip. If you’re coming from out of state, you can relax knowing that we’ll take care of providing your gear, including fly fishing rod and flies. We recommend you pack sunglasses, sunscreen, rain gear and a hat in order to ensure your comfort during the tour.